Banish your opponent’s entire hand, and if you do, they draw the same number of cards. You can banish this card from your GY, then target 1 “Trickstar” monster in your GY; Special Summon it. Trickstar Reincarnation wraps up our Trickstar week on Pojo. Anyone can use this card in their deck, as it requires no special conditions, the key to this card being so good is when it is combined with other Trickstar monsters. When you banish your opponents hand and they redraw the same number of cards, the burn damage Trickstars can do with this play is what makes it a great card. Other cards like Protector of The Sanctuary and Droll & Lock Bird combo with this card to stop your opponent from redrawing. The Special Summon effect off the banish of this card in your graveyard is great as long as you have a Trickstar to use it with. Regardless, this card can see play in any deck or side deck in the game. If your opponent hunts down a few things from their deck and add them to their hand, this card can rip their hand apart. This card can be an all-for-not as well, or even backfire if your opponent gets a better hand or gains effects of banishing their cards, but that is the risk you take. This pretty much wraps up the core of the Trickstar Engine. Trickstar Reincarnation is a free Normal Trap Card that can actually be used in any deck. Simply activate it to force your opponent to banish their entire hand and draw the same number of cards. With Droll & Lock Bird, they can potentially draw nothing. In Trickstars, Lycoris will usually do 1000 points of damage and hopefully you have Light Stage to do 200 more. The more Lycoris, the more damage. Also in Trickstars, Reincarnation will banish itself from the grave to Special Summon a targeted Trickstar. Nothing about this card is once per turn, the monster can be Special Summoned in any position and maintains all their effects. I’d love to see this card used to deck the opponent out, particularly in multiples with Card Destruction. Their are decks that benefit from having cards banished, but the overall potential of this card is limitless. Trickstar Reincarnation is stunning as well. Own three forever for any deck or side deck. Happy Friday! We end this week off with the card you all probably saw coming, Trickstar Reincarnation. Trickstar Reincarnation is a Trap that when activated, makes your opponent banish their entire hand and draw cards equal to the cards banished. I mentioned the Droll & Lock Brid combo yesterday, but still this can be disruptive and annoying for the opponent. First off, getting cards back from the banished zone is something not every deck does, so those cards banished are likely gone forever. Secondly, this can be used after a search whether you have Droll & Lock Bird or not to give your opponent a new hand and make them reconsider their plays. The only negative about this part of the effect is using this against Thunder Dragons and giving your opponent several effects, so that is why you should have Droll & Lock Bird on hand for that match-up. This card can also be banished from the GY to revive a Trickstar monster from the GY. Getting Lycoris is probably the best bet in case you have another Reincarnation to do around 1000 damage off the Lycoris alone, cause your opponent will likely have to draw probably around 4-6 cards when you use this, meaning Lycoris burns for 800-1200 per Lycoris and per Trickstar Reincarnation, plus add 200 from Light Stage if you control it. The deck can do a lot of burn and this card gives the deck some strong disruption and it eats away at the opponent’s deck. Another staple in the Trickstar deck, it’d be perfect if it weren’t for the cards that benefited from being banished and the probably of not having Droll & Lock meaning you can give your opponent a better hand. Art: 5/5 Holly Angel surrounded by roses is just so pretty. Much as you did last week, I’m willing to bet you saw this coming to close the week. Trickstar Reincarnation is a Normal Trap with a rather simple effect. Your opponent has their Hand removed from play, and then Draws the same number of cards Back. (Droll & Lock Bird from yesterday would shut that down and just have your opponent lose their Hand without them getting it back). Furthermore, you can remove this card from your Graveyard to Target a Trickstar (alson in your Graveyard and Special Summon it. This latter effect is a break-even (The Trap for a Monster) but something you can advantage off. And the beginning effect discussed is a -1 on paper, BUT, if you lock your opponent out from being able to refill their Hand can end up netting you a +, possibly a large one. 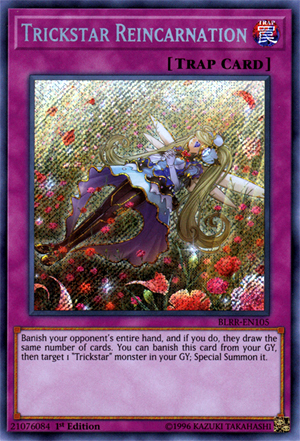 Them losing 1 card is a break-even also (their one card for your Trap) and everything after that is a +x, and you’re using this at the maximum time, when your opponent springs a big play, (etc etc) to make this the biggest advantage that you can, and ideally, removing the same turn to bring your Trickstar Monster (whatever it is) back to your Field. Rating: 5/5 (Timing is big with this, as is having what you want/need in the Graveyard) but it can definitely mess things up for your opponent, and be a big swing for you. Art: 6/5 This is beyond beautiful, all the roses, the art on the doll, this picture is literally Heavenly to me.